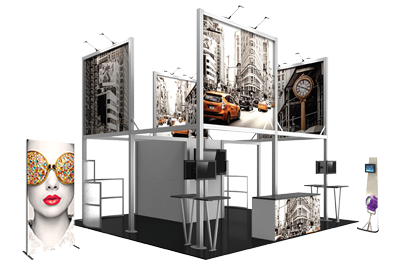 Hybrid Pro™ Modular Kit 10 is a 10ft x 20ft display solution that is sure to command attention. This modular display kit combines aluminum frames, push-fit SEG graphics and monitor mounts, coupled with a backwall counter with locking storage, literature racks and LED display lighting. Foreground counters are sold separately. Kit 10 is reconfigurable into Kit 02 10ft x 10ft display, increasing the versatility of this exhibit.